TDL Dry Suit Inflation System is a self-contained integrated valve and first stage assembly Measuring only 2 3/8 inches tall this is the most compact valve/regulator system in existence. The regulator is a balanced piston first stage with an intermediate pressure set at the factory at 120 psi. 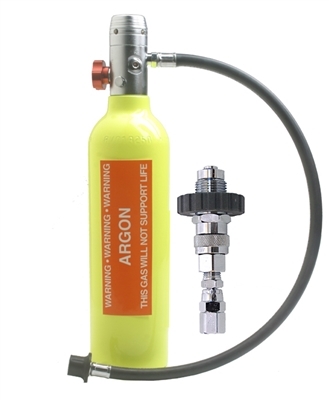 Each regulator has 2 LP hose ports and one HP hose port for a gauge, a safety assembly (burst disk) and a special one way fill valve is built into the regulator to allow for easy filling with the fill adapter. Use the unit with Argon for added thermal protection or just air. Either way it works great!